The hotel is located close to the center of the district town of Trutnov at the foothills of the highest and most famous Czech mountains Krkonoše. 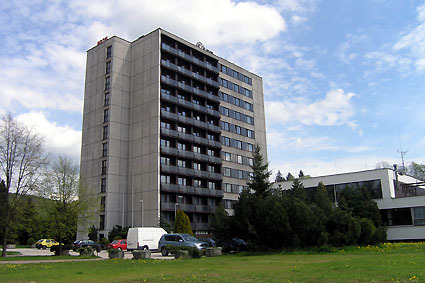 The location combines the easy reach of the reknown mountain centers, Jánské Lázne (approx. 15 km) and Pec pod Sněžkou (approx. 25 km) with the cultural and leisure events of the district town. The hotel offers 216 beds in twin and three-bedded rooms, all rooms with bathroom and toilet facilities, radio and telephone. TV sets available on request.